Philippe Silberzahn is professor of entrepreneurship and innovation at EMLYON Business School, and research fellow at Ecole Polytechnique in Paris, France, where he received his PhD. He is the author of several books on strategy, entrepreneurship and innovation, and blogs at philippesilberzahn.com. His research focuses on how organizations deals with situations of radical uncertainty. He studies this question from two angles: from an entrepreneurial angle, with the creation of new markets and new products, and from a managerial angle, with the management of disruptions, strategic surprises and wicked problems by large organizations. 1) N Bry: Philippe, would tell us a little bit about your background: how did you become a champion in innovation management, focusing on how to deal with uncertainty, seizing opportunities to produce entrepreneurship, and handling disruption threats from a large company point of view ? What were the main triggers in your experience driving you to develop these specific skills? Philippe Silberzahn: When I was 15, in 1982, my dad came back from Paris and dropped a big brown box on the family table. It was an Apple II. It was a revelation. I started writing programs with my brother. I sold one to one of my dad’s colleagues. 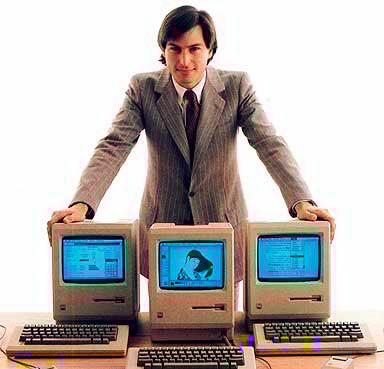 Then there was the mac and we started our first company in 1987. There was no plan, no vision, we just went on. Later, with our second company, we provided software products and services to large companies. We saw their struggle to remain innovative, how hard it was for them. We knew we could bring them a lot but somehow they were stuck in old practices, especially in France a kind of “we are big, you are small, so we know and you don’t” attitude. Later, as I was reading a lot about innovation and entrepreneurship, I was struck by the fact that was I was reading didn’t correspond to how we were approaching entrepreneurship: they told we should have a vision, we didn’t; we should have a plan, we didn’t; we evolved our products based on customers we met. Then one day I read about effectuation, and I said “That’s it, that’s me!” So my approach to entrepreneurship, which I then discovered was also the approach of most entrepreneurs, wasn’t theoretical nor intellectualized; it was just: go and do stuff with others, work hard, iterate quickly, be a reflective practitioner. 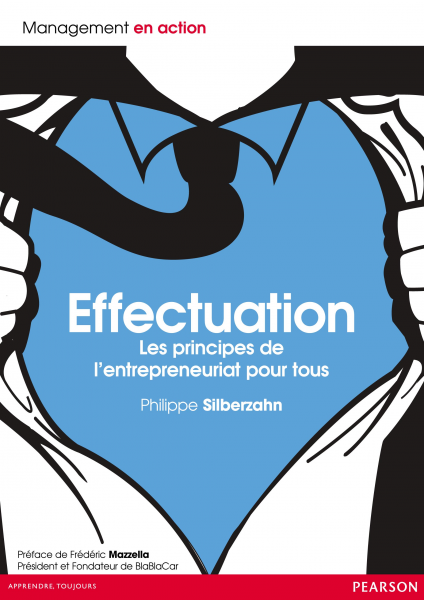 2) I attended your terrific lecture in September about Entrepreneurship, based on your book on Effectuation published last February: would you remind us the 5 principles that underlay Effectuation theory? Are there some commonalities with what François Jullien in his Conférence sur l’efficacité describes as ‘the Chinese efficiency: not trying to apply erstwhile model, but taking advantage of each situation’s potentiality, assessing and leveraging on the growth drivers’? Essentially, effectuation says that entrepreneurs define what they can do by looking at what they have. Whereas classic strategy says “define your goals and then find resources to achieve them”, effectuation reverts this and says “Look at what you have, and see what you can do with this”. Hence the five principles: entrepreneurs start with what they have (their personality, their knowledge, and the people they know); they think in terms of affordable loss, not expected gains; the take advantage of surprises instead of avoiding them; work with others to assemble the resources your project needs; and be the pilot in the plane, i.e. create the future instead of discovering it. François Julien’s point about the Chinese approach to strategy indeed shows commonalities: taking advantage of the situation rather than modeling the environment and trying to force-fit it into the model is exactly what effectuation is about, but military analogies are dangerous: effectuation takes advantage of the situation by bonding with others, not fighting them. Also I would argue that this is not a specifically Chinese approach: Napoleon’s strength was always to take advantage of the situation, and De Gaulle famously wrote “Appreciate the circumstances, that is the role of the leader”. We can also see that Effectuation, with its emphasis on novelty coming from action, has its roots in the American pragmatist philosophy of Dewey. 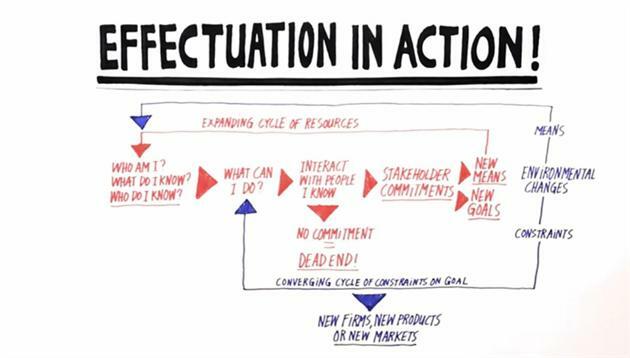 3) Effectuation turns into a virtuous circle of innovation and growth: how would you describe its process? And how can you ensure it doesn’t die when the organization grows? The two key elements are as follows: One, entrepreneurs determine new objectives based on the resources they have. It’s fundamental. The art of entrepreneurship is to imagine new uses for an asset. Making money out of garbage is the extreme illustration of the subjective value of anything. Two, entrepreneurs get new resources from stakeholders. These stakeholders commit to the project by providing resources and together with the entrepreneur, they decide what to do. For instance, a potential customer asks changes to a prototype and commits to buying five units once the changes are made. So you can see the virtuous circle: The entrepreneur starts with existing resources (who he is, what he knows, whom he knows). He imagines what he can do with that. He interacts with others based on this idea. Somebody is interested and commits. Hence, the entrepreneur has a new resource, based on which he can imagine something new, then interaction again, more resource, a more ambitious goal, new commitment, new resources, and so on. So we have an increasing network of stakeholders, a growing set of resources and more and more ambitious goals. Naturally, we also have an increasing set of constraints, because all these commitments have to be negotiated, but this has benefits: it forces the entrepreneur to have a direction instead of going in all directions. Now, when the entrepreneur sets out with his idea and nobody wants to commit, then it’s a dead end. Back to the drawing board, the idea is not viable. 4) Taking the angle of disruption threat on established business, you have issued a new book on Disruptive Innovation summarizing Clayton Christensen various writings, and showing how rational resistance to change, lead large companies to their loss. Taking the long view on Christenson work, did you notice that his theory evolved over time, and did you identify which elements improved it? Initially Christensen posed the problem in terms of technology. It was about disruptive technologies. But then some observed that incumbents had been disrupted in the absence of technology. This is the case for instance in the airline industry. There is no technological difference between EasyJet or SouthWest Airlines on the one hand, and Nortwest Airlines on the other. It was also observed that in some case of radical technological change, incumbents were able to maintain their advantage and successfully ride the wave of disruption. In telecoms, for instance, incumbent fixed line operators all became successful mobile operators, despite the fact that mobile telephony entails a radically different technology. Why was that? Christensen’s explanation is that the real challenge in a disruption is when it requires a new business model; hence the problem is posed in terms of business model conflict. 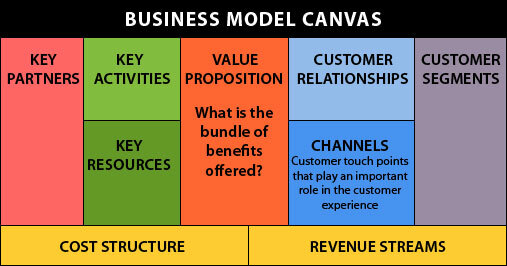 A business model is not just a value proposition; it is also the resources, processes and values (RPV) that are necessary to deliver this value proposition at a profit. Being successful means optimizing the RPV for the firm’s market. Over time, however, these RPV come to also define what the firm cannot do and therefore what the firm will find attractive and not attractive. For instance, traditional airlines have known about the low cost disruption for years, but given their RPV (emphasis on service for instance), they cannot find a low cost offering attractive. It doesn’t make sense to them. So to me what Christensen’s theory has evolved to is interesting in two ways: first, in showing that disruptive innovation is a business model issue, and second, that a business model is a reflection of a firm’s identity and therefore, that it’s first and foremost and organizational issue. It’s not about great ideas, it’s not about foresight, vision or adaptation. It’s about creating the right organizational ‘devices’ to make disruptive innovation possible. 5) Though Christensen does not dig into the digital revolution, would say that disruption is particularly harsh and in short cycles in this industry? He does, in fact, dig into it when he writes and talks extensively about disruption in education. It is true that one of the things he insists most on is the fact that a disruption is a process. It’s not a fact, it’s a process. It can go on for years and its effects can take a long time to show. There are some industries where innovation goes faster because technology remains a fundamental driver of disruption. We can even argue that digital is compounded because it creates disruptive tools: platforms, ready-made modules, etc. It’s also because there are no hard assets, so yes, it’s particularly harsh. But it’s not only in digital: I worked for the telecom industry: looking at the swiftness of the iPhone invasion and the quick demise of BlackBerry and Nokia is almost a traumatic experience. How can it go so fast? Partly it’s because of the supply chain revolution. The numbers of devices Apple or Sony are able to manufacture and deliver in one single day when they launch a product is staggering. When IBM introduced its PC in 1981, units shipped were only in the thousands, and it was a revolutionary product. 6) The platform for rapid innovation, is based on four principles. finally, fourth principle is modular design: to streamline cooperation, let’s design modules and deliver API that will let others create value on top of your platform. 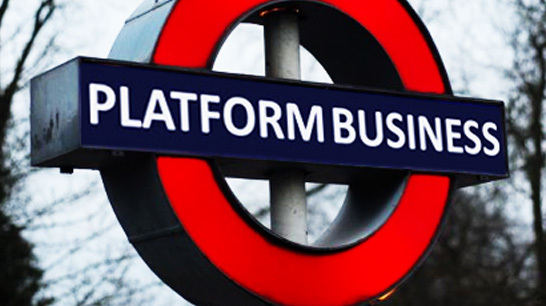 Would you find in this platform some weapons for large companies to fight disruption, and embrace change more rapidly? Yes, and I would highlight autonomy and strategic alignment, which at first seems to be a paradox, but the ability to manage this tension is crucial. Modularity is also important. I mentioned earlier how the increasing availability of ready-made modules accelerates the development of innovative products. It represents innovation on the production means, innovation to better innovate so to speak, what Jim Collins used to call “innovation squared”. With regards to the second principle, the creative tension, I agree that innovators must exist in some state of tension: innovation is not invention, it’s not “go and imagine stuff and come back when you find something” as it could exist in some research lab. Innovation must be measured, but it must be measured in a different way, particularly if it is disruptive: measurement criteria must be invented along the way because you are dealing with the entirely new. 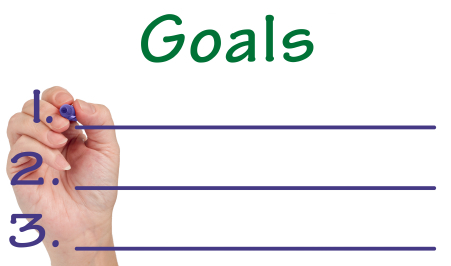 Reflecting on what Effectuation tells us, however, I would caution against goal setting. I have seen many failures in innovation because management set too ambitious goals at the outset. If you have too ambitious goals, you will cut corners, you will not take the time to experiment, and you will fail. Remember that it too ten years for the PDF technology to become profitable, and 21 for Nespresso. Innovation starts small, very small, and remains small sometimes for very long before taking off. Wait a bit to set ambitious goals.